On my 12th birthday in 1980 I called early in the morning to confirm my appointment at the White House. Specifically, I had a meeting scheduled with Rex Scouten, the Chief Usher of the White House. In other words, Jimmy Carter’s butler. I had spoken to him several weeks earlier when I “interviewed” him for a local newspaper. I had casually mentioned to him that I was planning on going to Washington DC for my 12th birthday and could I stop by and see him to interview him in person. Of course, he said, I would be happy to personally give you a tour of the White House. A little off the beaten track, he said. Being 12 years old, I had no plans to be in Washington DC on any day at all, particularly my birthday which was falling on a school day. In fact, I had zero control over my life and wasn’t even allowed to be on the phone that afternoon, talking to the Chief Usher of the White House and a man that served every President from Harry Truman until his eventual retirement during the Clinton years. But I used a technique that’s worked for me many times since then – I “faked it til I made it”. As far as Rex Scouten was concerned, I was coming to Washington DC on my birthday. I showed him a letter Rex Scouten had sent me after I had first interviewed him, stating that I can stop by any time. So my dad arranged for himself to have some business over in Washington (I had no concept what he did for a living but if possible, please, could we stay at the Watergate Hotel?) and we were off to DC. I had to keep busy while I was there. I wasn’t meeting “Rex” until the afternoon so I needed to fill up my morning or else it would be a waste. So I called my local congressman and he agreed to meet. And his incoherent senile blathering almost made me late for my other important meetings. I met with Senator Dale Bumpers from Arkansas, who I interviewed (I asked him if he wanted to be the Vice-Presidential candidate and he said he enjoyed being a Senator too much), Senator Nancy Kassenbaum from Kansas (I was in love with her), I ran into Tip O’Neill, the Speaker of the House, in the hallway but he was surrounded by people so I couldn’t talk to him. I showed up unannounced at Senator Birch Bayh’s office (father of Evan Bayh). And guess what? It was his birthday also! So his staff brought in his birthday cake and sang Happy Birthday to both of us. My dad joined up with me and we met with Sen. Paul Tsongas from Massachusetts. He said he hoped Ted Kennedy would win the primaries so he could be the senior senator from Massachusetts instead of the junior senator from Massachusetts. Later, we went to the White House, and while we were waiting for Scouten, we saw Carter, Mondale, and other random people walking down a hallway. For the next few months I made non-stop phone calls to everyone I could. I was a phone addict. I’d get home from school and start dialing “202” all over the place. Both my parents worked and once General Hospital, the soap opera, was over (I had to see if Luke and Laura were going to stop Mikhos Cassadine from taking over the world) I got to work. “202”, “202”, “202”. I interviewed for the local newspaper every Senator who would return my call. Sometimes in the morning I’d wait outside, crouched behind a bush in the backyard, until I heard the garage door open and close twice, signaling that both my parents were gone for the day, then I’d go back in and get an early start on the phone calls. Not only would I run up my parent’s bill but I’d run up my unemployed older sister’s bill, charging phone calls to her “212” number. How else was I going to talk to Bill Bradley? Or Jim Boren, who was specifically running to be Ted Kennedy’s Vice-Presidential candidate with the campaign motto “When in doubt, mumble”. Finally, I can’t remember his name, but I got a phone call from the editor-in-chief of “The Home News”, the local newspaper serving central New Jersey. 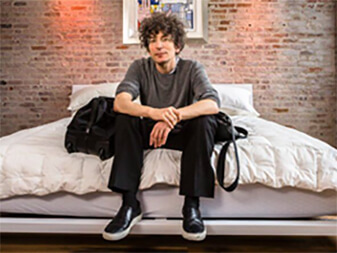 “Is this James Altucher?” he asked. And so my career as a writer was over before it even began.